There are several causes of the herpes viral infection of the eye. With this contagious disease being responsible for more than 500,000 cases of ocular herpes each year, it’s important to understand how the disease gets into the eye and what can be done to treat it. The herpes virus, particularly the herpes simplex virus-1 (HSV-1), is the most common herpes virus to affect the eye, and is also responsible for sores most commonly found on the mouth (cold sores). Once infected, the virus can be reoccurring during times of stress or remain dormant. Once the infection reaches the eye, it typically remains in the top layer of the cornea. There have been more serious cases of it reaching deeper layers of the cornea as well as the eyelid, retina, or iris. Typically, a herpes viral infection of the eye is caused by direct or indirect contact with another person who is experiencing an outbreak. It can happen from touching an area infected by HSV-1 and then touching an area surrounding your eye, or if an infected area directly touches your eye. The virus enters the body through the nose or mouth and travels through nerves, where it may stay inactive. Triggers such as stress, fever, or sunburn, can sometimes cause an outbreak to occur. If you think you’re showing signs of an outbreak of the herpes viral infection in your eye, let FastMed Urgent Care help. We are a leader in providing prompt medical care when you need it. We can help you learn about the causes of ocular herpes and ways you can treat it. 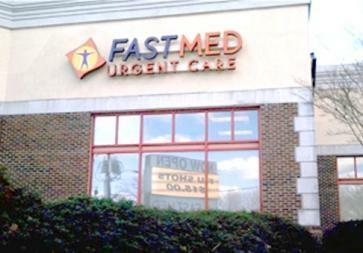 Visit your local FastMed Urgent Care location today!